I rested my nails for a day then decided to put new colors on them by Sunday. I actually don't have any specific plans when I'm doing nail art. Whatever comes in my mind, that's it. This is just a simple one which might look better if you have longer nails; but since I type all of the time, I need my nails short. Don't forget to use the Nail Hardener and Base Coat first and foremost. After that, I applied the Touch of Tan shade all over my nails. I, then, applied the White Satin slantly half on my nails for some style. Then, I used the rounded tip of the hair pin to dot the white part with the Baby Pink shade. 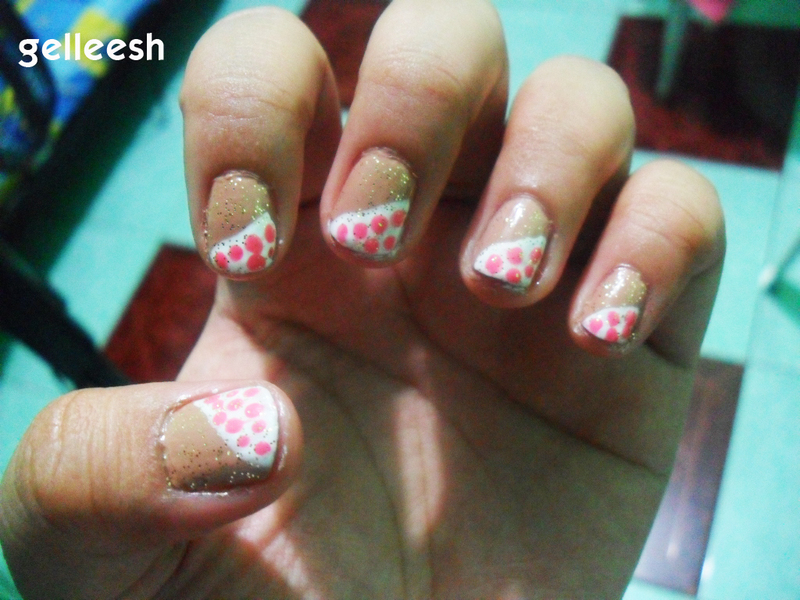 I topped it all off with the Glittery Gold Nail Polish then the Fast-Dry Top Coat. I wanna draw stuffs on my nails again, that is why I need to buy a dotting tool soon and other nail stuffs.I hope you like this simple design and don't be afraid to test your creativity. You will never know what amazing things you can create. hehe.. bilis ah! hmm I really should make sure that I have a base and top coat for my nails then. Thanks for the tips! mwah!